For the first time in its history, BOMEX® came to the Queen City of Regina! From September 20-22nd, BOMA Regina was thrilled to host industry colleagues from across the country, and share a taste of what the city has to offer. Regina is a city that continues to experience positive economic growth and has a very diverse culture. From farm to table food experiences showcasing Saskatchewan ingredients to touring unique venues, conference delegates were treated to a glimpse of the sights, sounds, and attractions of the region. The rolling hills were steeped in fall color out at Deer Valley Golf Club, site of this year’s golf tournament. The fall colors were also on display at The Willow on Wascana, one of Regina’s fine dining farm-to-table restaurants. Overlooking Wascana Lake and the Legislative Building, this restaurant is situated in one of the largest urban parks in North America. Attendees at the opening reception were awed by World Champion Hoop Dancer Terrence Littletent, who hails from Regina. Held on the grounds of Depot Division, Canada’s sole training facility for the RCMP, guests were able to view the many art and multimedia exhibits at the RCMP Heritage Centre that follow the rich tradition of the Royal Canadian Mounted Police throughout their history. Social night featured unique food and drink at several downtown establishments, along with local entertainment. The highlight, of course, is the National Building Awards Gala, where winners of the Pinnacle, Earth, TOBY, and Chairman’s Awards celebrated their Crowning Achievements during an evening filled with entertainment – including a surprise operatic performance that was highly fascinating! In addition to the many social networking opportunities, BOMEX® 2016 presented a wide variety of fresh and innovative educational opportunities. New BOMI courses were introduced; Building Information Modeling (BIM) was presented on the City’s new Mosaic Stadium; construction and renovation standards were discussed; Commissioning for Performance and Retro-Commissioning were reviewed; and who could forget the advancements in Drone Technology and its application in the building industry? Equally unforgettable were plenary session speakers. Amanda Lindhout gave a riveting speech on the importance of the power of forgiveness and embracing compassion. Joan McCusker shared her philosophy on building successful teams – and her gold medal! Kellie Garrett is a change maker who believes that employee engagement and leadership are synonymous. And the Executive Round Table featured industry leaders from across the country, who shared their views on current events and topics that affect the real estate industry. 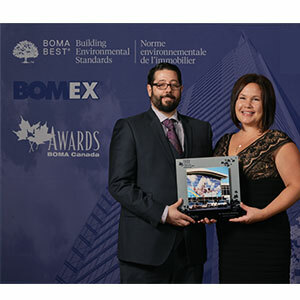 BOMA Canada’s Crowning Achievement at BOMEX® 2016 was the official unveiling of BOMA BEST 3.0. Delegates in attendance were the first to see a live demo that features new standards and enhanced functionality through an interactive presentation. The success of BOMEX® in Regina is directly attributable to the hard work of the organizing committee, and the many volunteers that worked to make this event a royal experience for all in attendance. Their efforts were rewarded and acknowledged by the overwhelming response to our events, programs, and City. On behalf of BOMA Regina and the organizing committee, many thanks to all of the volunteers and sponsors of BOMEX® 2016, and congratulations to all finalists and award winners!